This wine was made from truly top-quality grapes of excellent ripeness, which is demonstrated from the beginning to the end of the tasting. The wine displays an intense colour with a bluish rim and a cherry-red core. Attractive, perfectly integrated fruit aromas come to the fore with power and concentration. Decant the wine if there is any deposit. To be enjoyed now or over the next two years. Serve at 14°C to 16°C (57°F to 61°F). 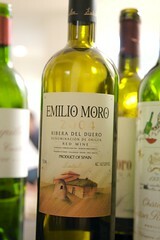 The reasonably priced 2004 Emilio Moro is a terrific Ribera del Duero aged in equal parts French and American oak prior to bottling. Its dense ruby/purple color is followed by a projected nose of blackberries, currants, cherries, smoky oak, and crushed rocks. Terrific texture, super purity, an opulent, full-bodied palate, and a long, heady finish suggest it will keep for 7-8 years.